​Cheesecake, I just love cheesecake. I joined a Facebook food group a while back and they started this little mini cook off type of a game, where someone picks 5 ingredients and everyone (who wants to play) cooks something with those 5 ingredients. You can use other ingredients as well, but the 5 specified ingredients need to be in the dish. So off I go on a google search until I find two recipes that I think I want to try. I like the ingredients of one, but I like the look of the other. One is a slice, the other is in a jar. So I decide I am going to make the slice but serve it up in a jar. They looked beautiful when they were done, so pretty, I was very happy with the end product, and am so happy I started playing this little game, as every two weeks now I am cooking something new and trying different things. Had it not been for the game I may have never made a pineapple cheesecake. Now, remember, I like to make these as individual desserts, but you can just as easily make it into a slice. Now I haven't done this yet, but the original recipe states you dissolve 1 tablespoon of powdered gelatine into 1/4 cup boiling water and once you have mixed in all the cream cheese mixture until smooth, you add the slightly cooled gelatine and then fold in the crushed pineapple. I have added shredded coconut into the biscuit base to give it a chewy kind of texture and a little more of a tropical feel, you can omit this if you want. In the biscuit base, only add enough butter for the biscuits to hold together, so even though I give you quantities, always add a little less than stated and keep adding only if needed. I do this with every cheesecake recipe I make. 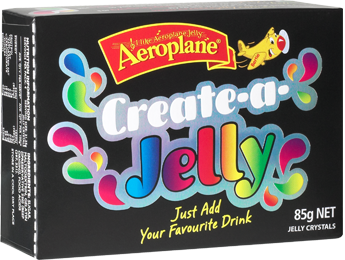 ​ With the jelly, I could not find pineapple jelly, but I did find a Create-a- Jelly packet. This was great, as by just adding pineapple juice to the packet mix, you made pineapple jelly. I did add a little yellow food colouring for extra colour, but in all honesty you don't have to, that was completely optional. The second time I made this I didn't have the create a jelly packet at home, so I thought I'd try making my own jelly from scratch. It was perfect, so I will provide a link to the recipe for homemade jelly that you can use instead here, if you prefer over the packet jelly. With the pineapple, I loved fresh pineapple on top over tinned pineapple pieces. The fresh had a nicer texture to the tinned. But having said that if you like tinned pineapple it was still good. With the fresh pineapple, the one that I had bought was a little hard and hadn't fully ripened. What I did to fix this is I chopped it up into small pieces, then I sprinkled on some caster sugar and allowed it to macerate for about 30 minutes before I put it onto the jelly. Just so you know, this is one of those desserts where you can change the flavour of the jelly and fruit and create completely different desserts. Strawberries and strawberry jelly with a chocolate biscuit maybe or peaches and peach jelly, you really can muck around with flavour combinations here. 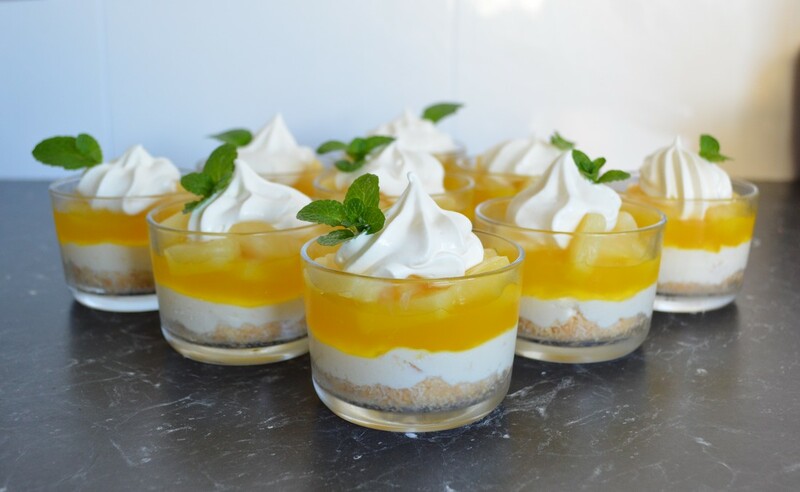 So if you are looking for something new to try or would like to make something with a tropical feel, try this cheesecake, it is so good, my family loved it, hope yours do to. For the biscuit base: Place the biscuits in a food processor and blitz until crumbs are formed, pour into a large bowl. Add the coconut and melted butter and stir through until combined. Using a spoon, distribute the crumbs into your glasses evenly, gently press crumbs down to level the surface. Refrigerate while you make the filling. Filling: Place the cream cheese and sugar in a large mixing bowl. Using electric beaters beat until smooth. Add the lemon juice and cream, beat until smooth. (If you were going to make a slice, this is where you would add the gelatine). Add the drained, crushed pineapple and fold through the cream cheese mix. Place the mixture into a piping bag, and evenly pipe the mixture over the biscuit base, carefully level the surface, making sure the entire surface is covered. Refrigerate for 3 hours, to ensure the cream cheese sets before adding the jelly. Make the jelly: Empty contents of packet into a bowl and add 1 cup of boiling water. Stir and dissolve well. Add the pineapple juice, stir well.​ Allow to cool completely. Once cool and the cream cheese has set, carefully pour onto the set cream. Refrigerate for 3 hours. 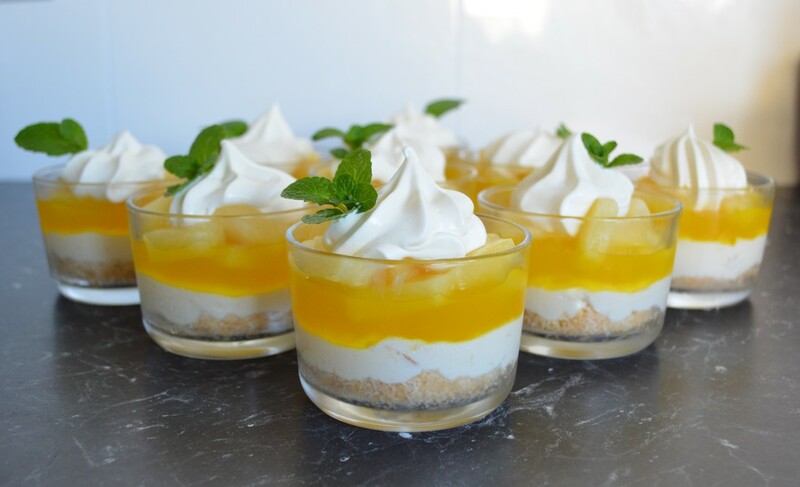 Add fresh or tinned pineapple pieces onto the set jelly. Just before serving, whip 300ml of thick cream until soft peaks form, place in a piping bag with a star tip nozzle and pipe onto the pineapple. decorate with mint leaves and serve.